I had been building up an appetite for a couple weeks, for an incredibly moist and dense apple Bundt cake. Don’t ask me why it had to be a Bundt, but it just, well, had to be. And I didn’t have a recipe for one, so I went digging through my cookbooks and online. Usually a pretty good judge of a recipe, I found one that looked interesting. But, boy, was I mistaken. It was beyond tweakable. Both the cake and the recipe got ditched in the garbage. Then I got to thinking about my favorite apple bread recipe, pulled it up on the iPad at the kitchen counter, and started making adjustments for a Bundt. It turned out to be exactly what I was looking for. But then I messed up the glaze. In a really bad way. 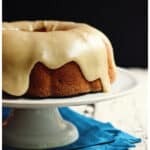 So please know that this Apple Bundt with Brown-Butter Vanilla Bean Glaze is all I promise it to be. 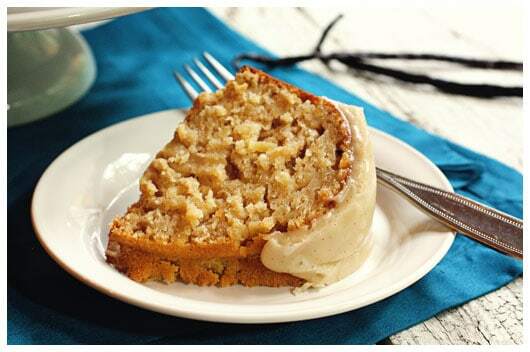 The cake is packed with apple cinnamon goodness, is as moist a cake as you’ll ever find, and bakes and slices beautifully. The glaze is just plain awesome, too. Its texture is thick and silky smooth. And the brown-butter lends it a deep almost caramel-like flavor, while the vanilla bean speckles tempt in the sweetest of ways. It’s a very good thing Cake #3 achieved apple cake perfection, as sweet Tessa was due a reward for stickin’ it out with Mom in the kitchen. We played. And we played. And we played! Preheat oven to 350°. Prepare a 12-cup bundt pan by smearing butter over every little nook and cranny of its interior. Then add some flour and tilt your pan so flour sticks to all of the buttery surface. Set pan aside. Stir the shredded apple with lemon juice and 1/3 cup of the white sugar. Set aside. In a medium bowl, whisk together the flour, baking powder, cinnamon, mace, nutmeg, and salt. Set aside. In the bowl of a stand mixer, combine the remaining 1 cup white sugar, brown sugar, oil, applesauce, eggs, apple cider, and vanilla. Mix to combine. Then add the flour mixture and combine once again. Add the apples and mix until the apples are evenly distributed. Pour into prepared Bundt pan and bake for 1 hour, or until a toothpick comes out of the cake clean. Cool the cake in the pan for 10 minutes, then invert onto your serving platter. 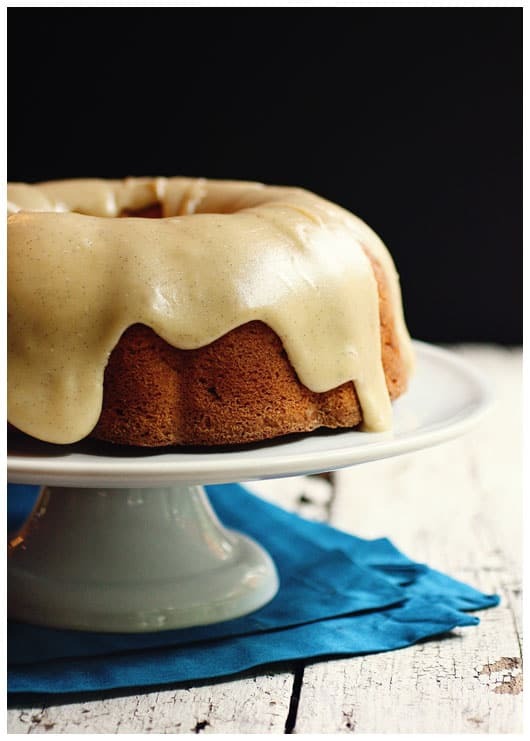 **If you are going to top the cake with the glaze, start making the glaze immediately, while the cake is still warm! Another option for serving this cake would be to finish it with a simple dusting of powdered sugar once it is cool. A dollop of slightly sweetened whipped cream or a scoop of vanilla bean ice cream would also be very good. First, pour 3 tablespoons of half and half into a small bowl and set aside. This is just to take the chill off, while you prepare the rest of the glaze. In a medium mixing bowl, combine the sifted (don’t skip the sifting!) powdered sugar and vanilla bean seeds. Set aside. In a large saucepan over medium-low heat, warm the butter until golden brown. It should smell delicious and toasty. If it smells burnt, you went too far! This should take about 6 to 8 minutes. Carefully pour browned butter into the powdered sugar and vanilla bean seeds, leaving the darkened butter sediment behind. Add 2 tablespoons of the half and half, then add the vanilla. Stir vigorously until smooth. You want the glaze to be somewhat thick, but easily pourable. If it seems too thick, add the remaining tablespoon of half and half. Pour the glaze over the cake while both the glaze and cake are still warm. The glaze cools quickly, so don’t delay! Let the glaze set. Then slice and enjoy! The cake fares well on the counter for a few days, covered with a cake dome. 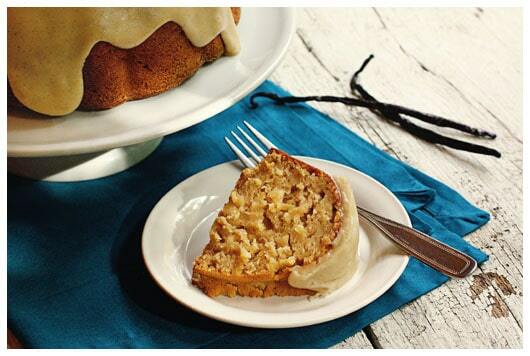 The Bundt cake was inspired by an apple bread recipe that Mom makes. The glaze was adapted from Martha Stewart. Cheryl at TidyMom for I’m Lovin’ It (Wallach House Flea Market) Fun stuff! Allison at Alli ‘n Son for Sweet Tooth Friday (Cinnamon Apple Muffins) Yum!